Whew...it sure has been a while! But that is because the Johnson household has been going nonstop since "summer" started (even though summer hasn't technically started yet! :))....I'm sure the rest of you would say the same thing. For some reason, I still have the kid mentality that summer is a break, because it used to be that I would have a break from school, so summer would "slow down". Well, ever since my school days have been over, summer doesn't give me a "break" from my daily responsibilitie. But it is a wonderful busy time! 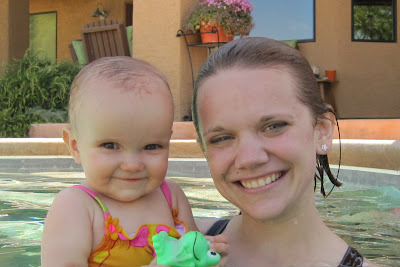 We kicked off our "summer" by taking a trip to Arizona to visit our wonderful family. It was truly a delightful, relaxing, time with the Johnson clan, and Linnea Joy was truly a "joy" :) to be around (last visit she had a bit of a difficult time sleeping, and wasn't quite herself). She napped beautifully (which was SUCH a blessing from the Lord) and grew to love Grammy, Grampy, Uncle Zach and Aunt Grace! I tell yah, it has only gotten harder to be away from family now that we have a little girl....There are so many days where I look at her and think about how much our families' are missing out on the joys of watching Linnea grow up. The Lord knows that this is exactely where we are supposed to be, and we LOVE it here, and I can truly say we are content and thankful, but sometimes I wish family could be closer. It is indeed a desire of my heart. But MORE than that, I desire to be right where the Lord wants us, and that is right here! (Now....let it be known that we do indeed praise the Lord for James and Kimiko, who live .25 miles away :)! ......sorry for that little detour...... but since so many of you DO live so far away, let me update you on what our little girl has been up to lately. She has been keeping mommy busy....really busy, because she is now cralwing all over the place! She started crawling shortly after my last post, which is probably why that was my last one until now :).She crawled for the first time over memorial day weekend while we were at Grammy and Grampys', which was so fun for them to see her crawl for the first time. She follows me all over the house, which is just adorable. She loves playing peek-a-boo. She did it for the first time in the car on our way home from Arizona. She likes to eat wood...if I'm not watching her, she will most likely be scraping her bottom teeth on the edge of the coffee table....and she eats her crib. Funny child. She just started clapping the other day, which is just so fun, and she now says more, which is clapping...we'll have to work on that one. :) I'll have to post a video of her clapping once I have it loaded. And if our daughter is not keeping us busy, than fellowshipping with other believers has! The last month has been a wonderful time of having people over, going to others' houses, birthday parties, visiting friends out of town, and having people visit us! Right now we have two young men from New Zealand staying with us before they head to Palm Springs for the Resolved Conference. They have been enamoured with all the big stores and how everything seems to be supersized! I think they are quite overwhelmed with all the choices in a store or restauraunt....not to mention all the different options of places to shop! Aaron made them french toast for the first time, and they quite enjoyed it (I think:)). We also hosted a neighborhood bbq last Saturday. My husband came home one sunday convicted about needing to reach out to our neighbors and not waisting any time... So 6 days later we did this bbq. We handed out invites to about 70 units, and about 30 people came! God is SO good! We got to know many different people, so it opened the door for building relationships. We were able to talk about the Lord here and there, but we didn't actually get the chance (or should I say "take" the chance) to share the gospel with anyone right then. We are praying ferevently that the Lord would give us great boldness and give us many opportunities to do so....and this bbq was hopefully one small step in the right direction. Other than that, and even most importantly, God has been teaching me so many wonderful things this past month....honestly, there is something I would like to blog about every day....I say "oh, I should blog about that later! "...and "later" only arrives in the form of needing to go to bed. God has been convicting me of sin, particularly in the area of my tounge...I have realized how selfish I can be with my speech...I often interrupt peoples sentences (I know, people like that probably dive you crazy!). Well, it drives my husband crazy and I even do it to my own friends. Every time I do it, it grieves me...I get so frustrated with myself....but I have repented of it many times and diligently seek the Lord in prayer to help me overcome my sin...my sin of esteeming myself (my own words) as more important than others (Phil. 2:3). He is slowly growing me in this area. "Do you not know? Have you not heard? The Everlasting God, the LORD, the Creator of the ends of the earth does not become weary or tired. His understanding is inscrutable. He gives strength to the weary, and to him who lacks might He increases power. Though youths grow weary and tired, and vigorous young men stumble badly, yet those who wait for the LORD will gain new strength; they will mount up with wings like eagles, they will run and not get tired, they will walk and not become weary." Oh, oh, oh how precious are those words. "I" do not fight this battle alone, and it is not by my strength....how ridiculous that I forget that so many times. The Lord is my strength. The Holy Spirit is within me, fighting my flesh. I need to RELY on the Lord! And He has not forgoten me. Even when I stumble badly, he will give me new strength as I wait for Him. So it's OK to wait and anticipate His return...in fact that is a great thing! But I am not to get angry in my waiting, but I am to sore with wings like eagles! I repent of my sin and lay it completely at the cross....and leave it there.